The McGill Middle East Program in Civil Society and Peace Building is taking rights-based community practices out of the social work textbooks and putting them to work in the streets of Israel, Palestine and Jordan. A nine-year-old disabled Palestinian girl couldn’t go to school because she couldn’t climb the stairs in her apartment building. Across the border in Israel, a municipality sued residents for not fixing sewage leaks. Meanwhile, a group of elderly Jordanian women had gone blind and lost hope of ever seeing again. These stories may not spring to mind when one hears the words “Middle East” and “conflict,” but such problems are a consuming force in many people’s lives. The good news? With the right kind of teamwork, these woes can be fixed. A coalition of social work agencies, for example, built a bridge to give the Palestinian girl access to transportation directly from her fourth floor home. The Israeli neighbourhood learned about its civic rights and, in doing so, discovered that the leaking pipes were the responsibility of the municipality. The elderly Jordanian women received medical check-ups, which revealed they just needed glasses. These solutions came about through the interdisciplinary efforts of a network of lawyers and social workers in Palestine, Israel and Jordan. Although these people may come from cultures long divided by conflict, they’re united by a dedication to outreach, public education and policy research. They share something else, too: They were brought together by the McGill School of Social Work. The MMEP is based on the Rights-based Community Practice model Torczyner developed in 1975 for Project Genesis, a community-based organization serving the multi-ethnic, low-income Côte-des-Neiges neighbourhood of Montreal. Since its inception, Project Genesis has brought together volunteers from within the community and has helped hundreds of thousands of Montrealers, originating from over 130 different countries, in accessing services and fighting for their rights. In the RBCP model, the means are as important as the ends: “The right of low income people to participate in processes and decisions that affect their lives, as individuals and communities, is as important as gaining access to the rights themselves,” says Torczyner. The process is participatory, and by promoting relationships among people of diversity, especially the disadvantaged, both within and between societies, people are ultimately empowered to find common ground and create social change. McGill PhD candidate Sami Kilani (right) is a Palestinian member of the MMEP executive committee. 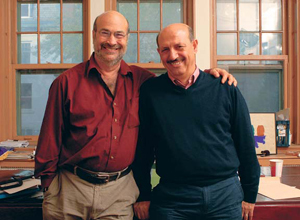 School of Social Work professor Jim Torczyner founded the MMEP in 1994 as a way to build peace in the Middle East by promoting social justice. The MMEP centres follow Project Genesis’s lead by establishing accessible, storefront locations where people can consult lawyers and social workers to get help with issues affecting their social rights, such as housing, income and education. The centres’ collective goal is to implement innovative programs to promote the rule of law, equity, peace and civil society amongst disadvantaged communities coping with conflict and economic hardship. The centres assist over 120,000 people each year. Although the centres serve their specific communities, and are mostly staffed by volunteers from within the communities, the team behind the effort reaches beyond religious and ethnic lines. The executive and management committees are made up of Canadians, Israelis, Jordanians and Palestinians—Christians, Jews and Muslims. The mix has helped develop new relationships, taking the program into uncharted territory with unprecedented results. For example, Israel’s national emergency medical and disaster service, Magen David Adom, had been excluded from the International Federation of Red Cross and Red Crescent Societies since its creation in 1930. The reason: Its red Star of David emblem wasn’t an approved symbol and the organization wasn’t about to replace it with an acceptable cross or crescent. Dr. Mohammed Al-Hadid, president of the Jordan Red Crescent Society and an executive committee member of the MMEP, hadn’t interacted with Israelis until he became part of the MMEP. After visiting Israel and witnessing Magen David Adom’s operations, however, he began lobbying on behalf of the organization. 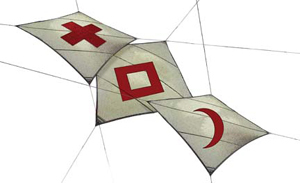 The International Committee of the Red Cross adopted a red crystal as a third symbol identifying relief and emergency workers, and the IFRCRCS admitted Israel in 2006. A symbol may seem like a small matter, but it has big consequences. Under the Geneva Convention, relief workers and vehicles identified with Red Cross-approved symbols must be granted unimpeded access to people in need. The red crystal means Magen David Adom now shares this privilege—and lives will undoubtedly be saved because of it. “The argument is: Look, there will be an earthquake,” Torczyner explains. “It’s not going to be a Jewish, Muslim or Christian earthquake. It’s going to kill people.” He argues that to save lives, victims must be taken to the closest medical facility, even if it’s across the border. Protocols for such cooperation are being developed now. Thanks to the efforts of the MMEP, 18 Jordanian students are now studying emergency medicine next door in Israel—instead of Australia, as they needed to do in the past. Each MMEP centre is founded and directed by a McGill graduate, and that initial connection blooms into even more connections on the ground. “It connects universities with practice and practice with real people,” Torczyner says. The nine institutional partners are now ready to take the MMEP to the next level by building an international organization, to be headquartered in Jerusalem. 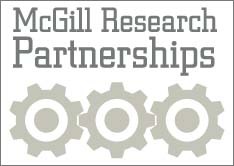 McGill will remain the research and training arm of the project, the “enabling third party,” as Torczyner puts it. workers to support patients in facing their day-to-day problems. Or when an MMEP centre in Jordan squelched a proposed cemetery relocation, which would have made it difficult for mourners to visit graves. The list goes on. Leduc credits such accomplishments to the relationships the centres and partners have developed through their subtle approach. “In many ways, their accomplishments confront the state around rights, which the governments could see as an obstacle. But they don’t.” What he finds remarkable is that there’s arms-length government support for the program, from all three countries, stemming from a belief that strengthening civil society, especially in the most disadvantaged areas, strengthens their respective nations by decreasing inequality and promoting social justice. The program itself is built on the understanding that the reduction of inequality and the promotion of civil society and social justice are intricately related to peace-building, both between and among nations. The McGill Middle East Program in Civil Society and Peace Building is principally funded by the Canadian International Development Agency.